Located in a strategic position to reach the Lake Garda with its amusement parks and picturesque countriyside in the Verona side just 15 min walking from San Zeno church in the city center, a short walk from the stadium and the railway station, stands, the B & B Alle Torri, a friendly and comfortable place to spend a pleasant stay in Verona at affordable prices. The B&B offers a simple and elegant design theme with furniture and attention to detail. Three are in fact our rooms: Luxury room with white furniture and a refined game gold and mirrors, Romantic, with a style, if dedicated, and the room 'to port' which recalls the style marinara. The rooms are comfortable and air conditioned with panoramic balcony. 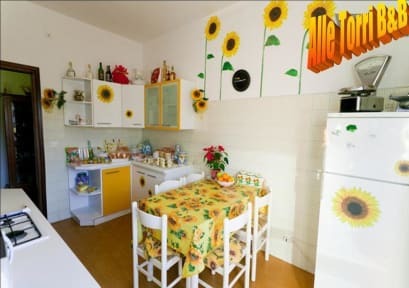 The Italian breakfast is served in the kitchen of the apartment, fresh every morning. The Bed and Breakfast offers the possibility to accommodate seven people in rooms double and triple. Comfortable common rooms are at your disposal: a room where you can enjoy a rich breakfast or relax. The staff is available for tourist information, and request shuttle service for airport transfers, train station, or simply the center of the city. The style and the furnishings make the rooms in the individual details of our B & B comfortable and welcoming. Please note, Verona has tourist taxes. The fee is 2,50€ per person per night to be paid at check in. We accept cash only. Please tell us your arrival time and please PROVIDE us a valid telephone number to contact you. No check ins allowed after 9 pm. If you don't tell us your arrival time and we are not at the property you should call us and wait for us to come to open. Please note that we reserve the right to preauthorize your credit card prior to your arrival. If your card won't work 3 days before your arrival, we must ask you to provide us with a new credit card, in order to guarantee your booking. If you fail to so and we won't have a card with available fund, we will cancel your reservation.